Fast food lovers, rejoice: There will be free onion rings at Burger King this weekend, while supplies last. Burger King is promoting the giveaway on Facebook and Twitter using the hashtag #bkfreerings. 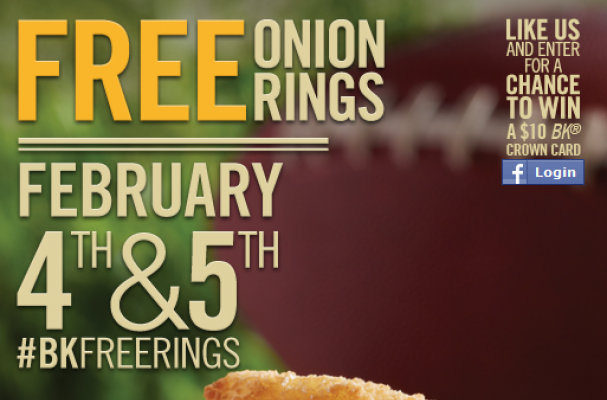 The giveaway is only on Feb. 4 and Feb. 5, so if you've got a soft spot for onion rings, mark your calendars accordingly. For a chance to win a $10 BK Crown Card, "like" Burger King on Facebook using the link below.